SunSetter Retractable Awning are the world's best known awning brand and the only awning to receive the Good Housekeeping seal of approval. 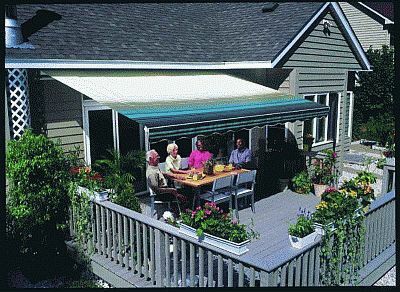 The SunSetter Pro model is one of the best values in retractable awnings on the market. 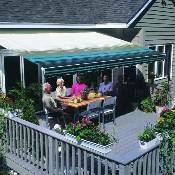 The price includes a sturdy awning frame with a double cable tensioning system, remote controlled motor, crank down front weather breaker screen (Not available with regular SunSetter Awnings), and a choice of seven attractive fabric colors. World Class SOMFY RTS motor with remote control. Extend or retract awning from within your home. Manual override in case of power outages. Fits under eaves and overhangs as low as 7 ft. 6 in. 12 to 18 foot awnings extend out a full 10 feet 2 inches from your house. 10-11 foot awnings extend 9 feet. Can be installed on any kind of siding, including wood, masonry, brick, aluminum and vinyl. Permanently attached to your home. No need to take it down in the winter. Integrated crank down front weather breaker screen. Mildew resistant and east to clean with mild soap. Scrub and hose off with water. Low cost cover is available to protect the motor and awning fabric without the need of expensive metal hood or removing the awning. Please choose what type of mount: wall or soffit (overhang) and which side you would like the electrical cord on, Right or Left (when facing where the awning will be mounted).